1-Convct ↑Anthony Cowdery married convict ↑Mary Ann McDonald. They had a daughter: Elizabeth. 2-Elizabeth Cowdery was born on 4 May 1865 in Brighton, Tasmania and died on 11 Aug 1940 at age 75. Elizabeth married Daniel Cobbett, son of Joseph Cobbett and Ann Pickford. Daniel was born on 21 Nov 1864 and died in Dec 1939 at age 75. They had two children: Stella May and Allan Lewis. 3-Stella May Cobbett was born on 2 Nov 1895 in Evandale, Tasmania and died on 25 Oct 1983 in St Marys at age 87. Stella married Leonard John Cocker, son of James Cocker and Alice Matilda Richards, on 11 Aug 1914 in Church of England, Cullenswood, Tasmania. Leonard was born on 30 Dec 1890 in Longford, Tasmania, died on 3 Mar 1963 in St Marys at age 72, and was buried in St Marys. They had three children: Roy Leonard, Ada Amelia and Allen Francis. 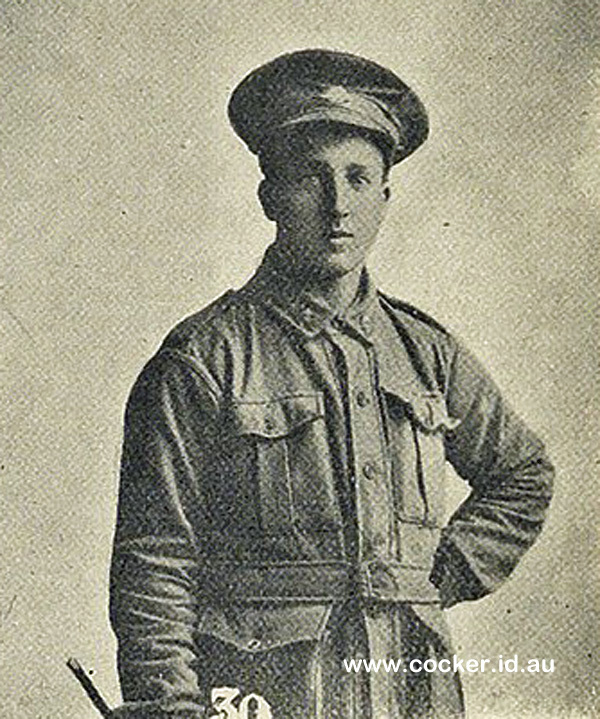 3-Allan Lewis Cobbett† was born on 2 Nov 1895 in Evandale, Tasmania, died on 4 Jul 1918 in World War 1 im Hamel, France at age 22, and was buried in Crucific Corner Cemetery (Plot X, Row B, Grave No. 2), Villers-Bretonneux, France. 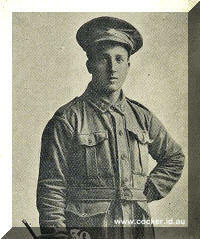 Cousins: Sgt Major W.J. Cobbett; Sgt Bert Cobbett; Sgt E.W. Birring. Corrections and additions are very welcome.